Preservative free. Dry eye therapy. Dual Action: Clinically proven to moisturize for fast relief; Restores your eyes' natural balanced. Long lasting relief. Ideal for sensitive eyes. Convenient, single dose packaging. Sterile single-use dispensers. Long lasting relief. This revolutionary advance in dry eye therapy provides soothing comfort and long lasting lubrication, keeping eyes feeling fresh throughout the day. This unique new formula restores the natural moisture in your eyes, providing effective, long lasting dry eye relief. Preservative-free so it's gentle enough to use as often as needed. Made in USA. Relieves dryness of the eye. Prevents further irritation. Easy to use sterile dispenser. To open, twist off tab. Apply 1 to 2 drops in the affected eye(s) as needed. Discard dispenser immediately after use. To open, completely twist off tab. 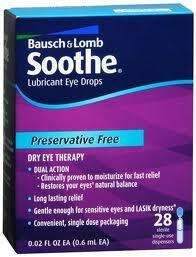 Instill 1 to 2 drops in the affected eye(s) as needed. Store at 68-77 degrees F (20-25 degrees C). Active Ingredients: Glycerin (0.6%); Propylene Glycol (0.6%). Inactive Ingredients: Boric Acid, Hydroxyalkylphosphonate, Purified Water, Sodium Alginate, Sodium Borate.